I did this walk on Wednesday 22nd August 2012. 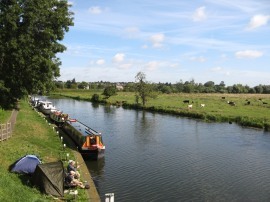 I had gone up to visit Anna the night before and it was just a short drive over from her house to Downham Market station for the train down to Ely and the start of this stage of the walk. The train journey took 17 minutes and cost me £6.30. 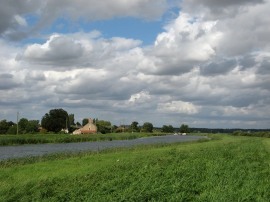 It was a generally bright day with a brisk wind blowing across the river from the left. 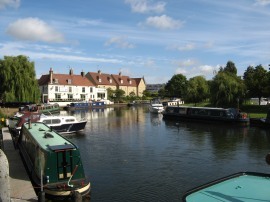 Reaching Ely I popped into the Tesco's besides the station to get my lunch before heading the short distance up the road back to the River Great Ouse, photo 1, to resume my walk. 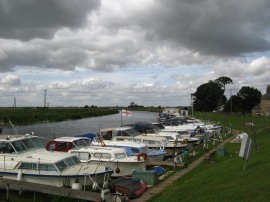 The path heads along past the waterfront buildings of Ely, photo 2, with the moorings of the Cathedral Marina opposite. In Ely there was an information board besides the river detailing the history of the draining of the fens and also one of the very occasional Fen Rivers Way information boards. I debated about going up to visit the Cathedral but I knew I had a long days walk ahead and was keen to get back at a decent time so remained on the river bank. 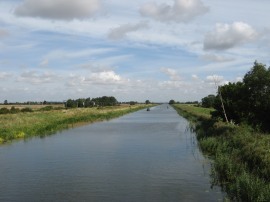 The river soon passes under the rail lines and it wasn't long before I was once again following the river across the flat farmland of the fens, photo 3. 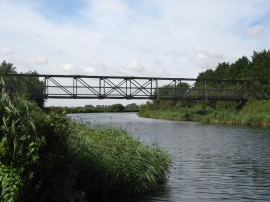 The route has to skirt round a small industrial estate, where it briefly links up with the route of the Hereward Way, and crosses over the Cuckoo Bridge, photo 4, which carries the path over the entrance to the Roswell Pits. 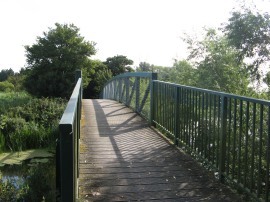 The route then heads through an area of scrubby trees which leads back to the riverside where the path crosses a large metal footbridge over the river, photo 5. 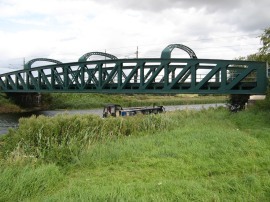 The route then follows the river alongside Queen Adelaide Way up to another rail bridge over the river, photo 6, this one carrying the lines that runs from Ely to Norwich. 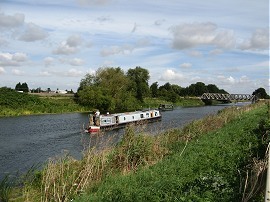 A short distance further on the river reaches the Queen Adelaide Bridge, photo 7. 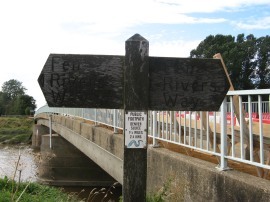 Here the Fen Rivers Way crosses the bridge over the river to join the floodwall on the opposite bank. 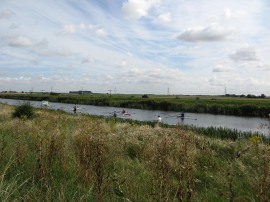 The route then continues on along an almost dead straight section of river, photo 8, for about three miles up towards Littleport. On the river there were several groups of rowers out receiving instruction. Shortly after I took photo 9 one of the boats capsized and despite watching for some time the rower was still having difficulty getting back into the boat. This stretch of path along the floodwall was quite overgrown, photo 10, and the tall grass considerably slowed my walking speed down and despite the breeze the grass was still damp and soon my feet and legs were quite wet. 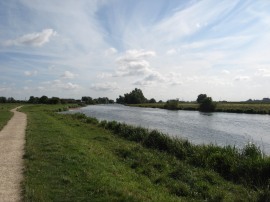 After a mile or so on the opposite side the River Lark joins the Great Ouse, photo 11, although generally there was not much of interest on this stretch of path. 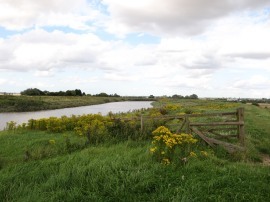 As I approached the outskirts of Littleport the path did improve slightly and the path then follows the river through a succession of back gardens, most separated by small gates. Theses garden were quite small and to me it felt a little uncomfortable walking by the houses although I guess the residents were aware of the right of way when they purchased the properties. 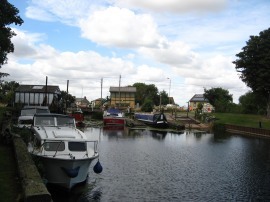 The route then crosses a road besides a pub before joining a broad waterfront path that is followed up to Littleport station. Reaching a small creek, photo 12, the path heads to the left up towards the station before turning to the right to cross the head of the creek. Joining Lynn Road, the route heads to the right before once again joining a waterfront path. There were a few benches here and I had my first short snack stop of the day, having walked just over 7 miles at this point. 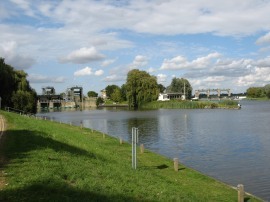 A short distance further on the route reaches the A10 where the Fen Rivers Way once again crosses back over to the other side of the river to join a path running along the flood wall with the river to the left and the A10 road immediately to the right, photo 13. The only problem being there soon wasn't a path. The flood wall was completely overgrown with grass at least knee high and as well as the grass there were also large areas of nettles and thistles to contend with too. The A10 road was busy with traffic and for most of its length walking along the roadside was not a viable option with only minimal verges so I was forced to plough my way through the undergrowth on what was the most dispiriting section of path I can ever remember having to walk along. This tedious slog went on for several miles before the path finally improved when it reached a picnic area by Black Horse Farm. 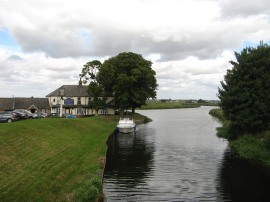 The route then heads on round to the Ship Inn and Brandon Creek, photo 14, by which marks the junction of the River Great Ouse with the Little Ouse River, photo 15. 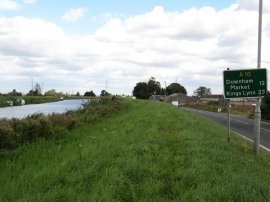 The route heads round besides the pub and along the driveway before crossing the road bridge over creek. 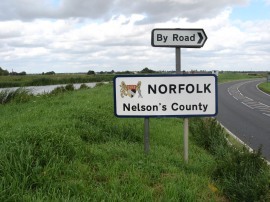 On the other side of the creek the Fen Rivers Way enters Norfolk, photo 16, the first time I have been walking in the county. 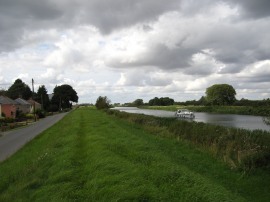 There was another brief stretch of walking alongside the A10 before the route heads along a minor road on the left. The flood wall was too overgrown to walk on but this stretch of road was quiet and provided a pleasant interlude before the road curves road back to the A10 where once again I had another stretch of walking along the top of the overgrown flood wall. 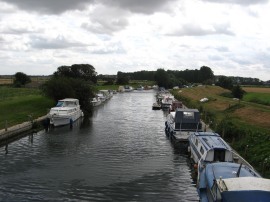 This was a much short section and I soon reached a small area of moorings, photo 17, belonging to the Denver cruising club where the river curved off to the left and away from the A10 road. This section of path was being grazed by cattle which had helped keep the undergrowth down although a couple of the cows where very flighty and one came running up behind me snorting away which was rather unsettling for a while although still preferable to the overgrown paths. I had spotted a lot of Grebes on the river, far more than on other rivers walks I have done, and I was also accompanied for a while by a group of swans, photo 18, heading downstream at more or less my walking pace. This stretch of path is followed for a couple of miles as the river curves its way round to Ten Mile Bank, photo 19, and on the way I had my lunch stop, sitting on the inland side of the flood wall which provided a bit of shelter from the wind. The wide open, and far reaching, views meant that any random landmark like a hay stack besides the path always took much longer to get too than I thought, an illusion I found quite amusing and I did feel my spirits rising after the poor section of path alongside the A10. At Hillgay Bridge, photo 20, the path once again crosses over the river and joins the flood wall running alongside Church. A small sign said it was 2.5 miles to Denver sluice and for much of this length, photo 21, I walked along the road as the road as it was very quiet and often not much below the level of the river. 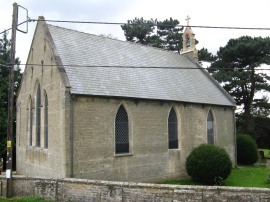 The path soon passes St Mark’s Church, photo 22, before continuing alongside the road and river. 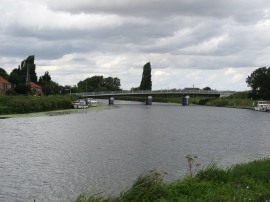 Approaching The Ouse Bridge, photo 23, which carries the Kings Lynn to Ely rail lines over the river the route has to follow the road heading under the narrow road rail bridge before the rejoining the floodwall. 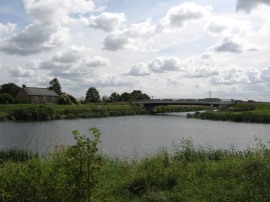 Just below the rail bridge the River Wissey joins the River Great Ouse from the right, photo 24. 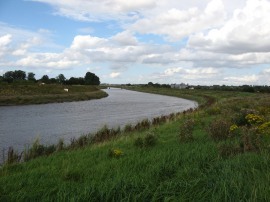 The route then continues on down alongside the road and river towards Denver Sluice. 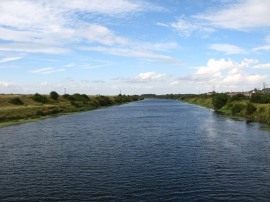 Here the River Great Ouse splits into two, photo 25, with the main river heading through the Denver Sluice and some of the waters heading to the right through the AG Wright Sluice and into the Great Ouse Relief Channel. The river crosses the road over the Denver Sluice before once again joining a footpath running along the top of flood wall. 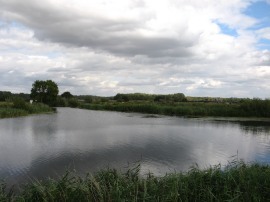 Below the Denver Sluice, photo 26, the River Great Ouse is tidal and also merges with the waters of the New Bedford River and, a short distance on, the Old Bedford River. 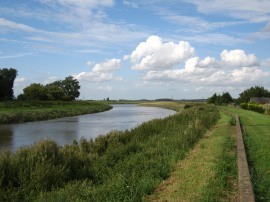 Both the Old Bedford River and the New Bedford River (constructed 20 years later in 1650) were intended to reduce or eliminate flooding of the fens of the Great Level by carrying the bulk of the water from the Great Ouse River from the uplands of Huntingdonshire to the sea in a straight channel, rather than allowing it to meander through the fens. 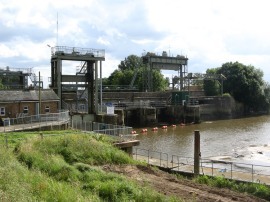 The river also passes the lock gates at the entrance to Well Creek. Fortunately the broad path running along the flood wall, photo 27, was not over grown and I was able to make good time down the river towards Downham Market with the buildings of the Heygates Flour Mill growing ever more prominent. 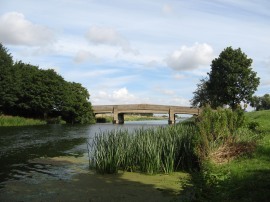 The path heads down to Downham Bridge, photo 28, which carries the A1122 across the river. 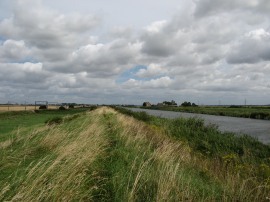 Besides the bridge was another of the small wooden way marking posts for the Fen Rivers Way, photo 29. Crossing the road the path heads along the grass covered embankment, photo 30, with a few business premises and then houses to the left. Passing through a gate the path heads into a more open area of land between the River Great Ouse, photo 31, and the Great Ouse Relief Channel which is where I finished this stage of the walk. 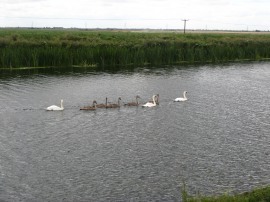 I then joined a path that headed the short distance back done to the A1122 from where it was just a short walk along the road over the Great Ouse Relief Channel, photo 32, to my parking spot at Downham Market station. Reaching the car the GPS said I had walked a total distance of 19.4 miles. I am enjoying walking through the Fenland landscape but this stage was severely let down by the overgrown paths, particularly on the section alongside the A10 from Littleport which was most unpleasant to walk along. I appreciate this was probably due to the time of year and the rapid growth the recent weather conditions seem to have created, I am sure in winter months it would have been a much more pleasant stroll along the floodwall without the knee high grass and stinging nettles, although two other reports I have read have also mentioned the overgrown paths on various parts of this walk. 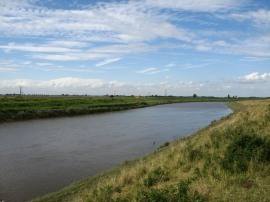 As usual I have uploaded the route of the walk which can be accessed here: Fen Rivers Way 2 route.